The Jurassic Period [201.3 – 145 million years ago] came after the Triassic Period and before the Cretaceous Period, sandwiched between both in the Mesozoic Era, [an era stretching from 252 to 66 million years ago]. The featured image is an acrylic watercolour illustration that I painted in 1982, one of my busiest periods where artwork is concerned. It can be located under Art in the Landscape and Wildlife categories. 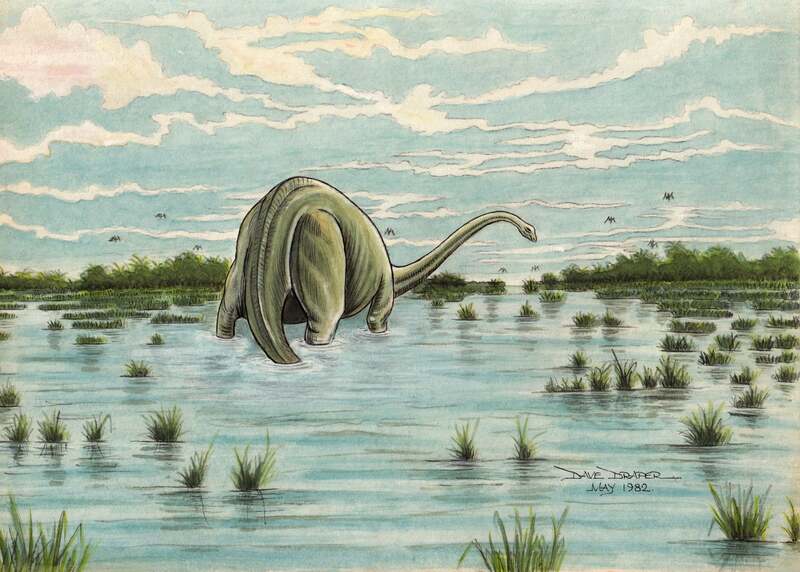 The denizen browsing and wallowing in this vast swamp is one of the hugest herbivores that ever lived. 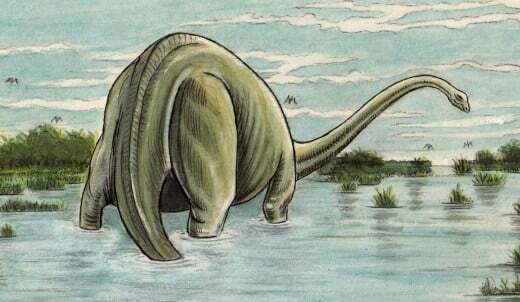 They were originally and more popularly known as Brontosaurs [thunder lizards] and then renamed Apatosaurs [deceptive lizards] by Paleontologist Othniel Charles Marsh [1831–1899] because he regarded the chevron bones as similar to those of some mosasaurs, members of a group of prehistoric marine lizards. The Brontosaur [or Apatosaur] is a genus of sauropod dinosaur that lived from about 154 to 150 million years ago, during the Jurassic Period [Kimmeridgian and early Tithonian ages]. 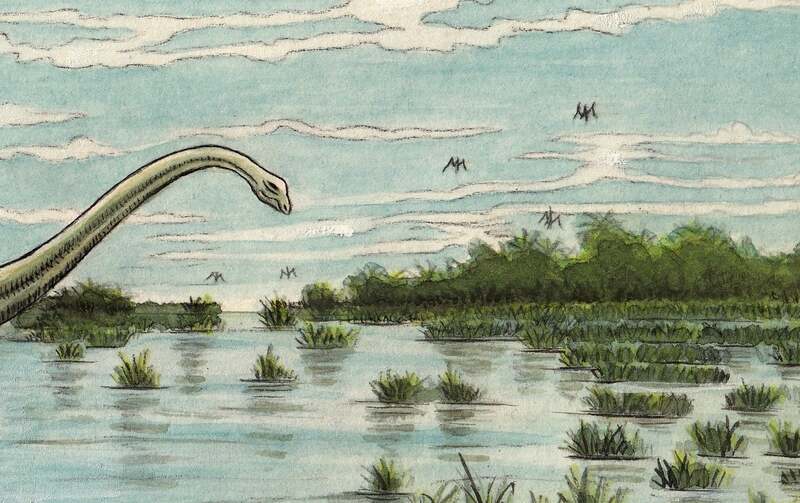 It was one of the largest land animals known to have ever existed, with an average length of 75 ft [23 m] and a mass of at least 16 metric tons [18 short tons]. Fossils of these animals have been found in Nine Mile Quarry and Bone Cabin Quarry in Wyoming and at sites in Colorado, Oklahoma and Utah, present in stratigraphic zones 2–6. The cervical vertebrae were less elongated and more heavily constructed than those of Diplodocus and the bones of the leg were much stockier [despite being longer], implying a more robust animal. The tail was held above the ground during normal locomotion. Like most sauropods, Apatosaurus had only a single large claw on each forelimb, with the first three toes on the hind limb possessing claws. 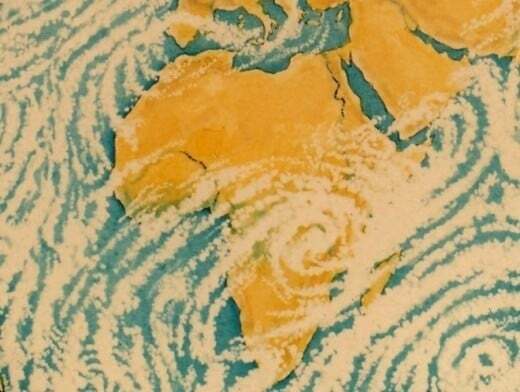 The featured image and those in the slideshow show views of the Earth from above as it is today. In the Permian Age, the familiar arrangement of continents we know today were fused together in one vast supercontinent called Pangea. In the Mesozoic Pangea began to breakup into two parts. The southern section was known as Gondwanaland, consisting of Africa, India, Australasia, Antarctica and South America; and Laurasia, the northern part, comprising the present day crustal constituents of Europe, North America and Asia. 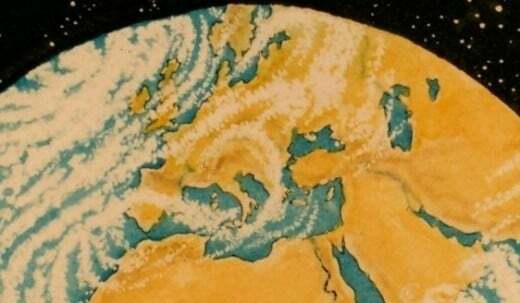 In the Permian age the Panthalassic Ocean surrounds Pangea to the North and West while the Tethys Sea fills the bowl-like depression in the southeast. From the mid-Triassic both oceans began to cut through from east and west in a narrow strip dividing north and south and widening out during the Jurassic in what would later become parts of the Mediterranean, Persian Gulf, Indian Ocean, Sunda Straits, Gulf of Mexico and the Caribbean with the vast remainder separating and dividing its contents between the Atlantic and the Southern and Pacific Oceans. The featured image, Jurassic Swamp and its two offshoots, Brontosaur Browse and Pterosaur’s-Eye-View, plus Africa Viewed from Above and its companion, Europe seen from Space; were all illustrations I made in 1982 and were painted in acrylic watercolours. The Saurischian Class was composed of the Theropods: [bipedal carnivores], which included the Megalosaurs, Carnosaurs, Allosaurs, Coelurosaurs, Tyrannosaurs, Maniroptera, Oviraptors, Deinonychosaurs, and Avians [birds] – and the Sauropods; [herbivorous quadrupeds], comprising the long-necked Brontosaurs[renamed Apatosaurs], Diplodocids, Brachiosaurs and Titanosaurs.